Today is a special day – my best friend since forever turns 23. I decided that my birthday gift to her would be a birthday cake. Over the years, Charlotte has given me some very thoughtful gifts; most notably are the ones she has made herself: a dress, a pillow with “BU” written on it, pajama pants, and a sweater with the Bishop’s song on the back (all of these items were purple!). She definitely has a knack for sewing. Home-made gifts are the best, and I wanted to reciprocate with something that I can make: cake. I got the recipe for “Perfect All-American Chocolate Butter Cake” from The Cake Bible by Rose Levy Beranbaum. The book recommends that all ingredients be fresh and at room temperature. Do not be afraid of eggs being at room temperature – in France they are always kept that way! Also, when a recipe calls for baking powder and flour, sifting them together twice makes sure the baking powder is evenly distributed within your batter (a little something I learned at Cordon Bleu). I mixed the cocoa powder and boiling water in a small bowl with a whisk and let it rest until it reached room temperature. Meanwhile, I combined the flour, sugar, baking powder, and salt in a large bowl. In a separate small bowl I mixed the eggs, vanilla and 1/4 of the cocoa/water mixture. Then, I added the rest of the cocoa/water mixture to the dry ingredients, as well as the butter, and used a mixer on medium speed to beat it for about 1 1/2 minutes. 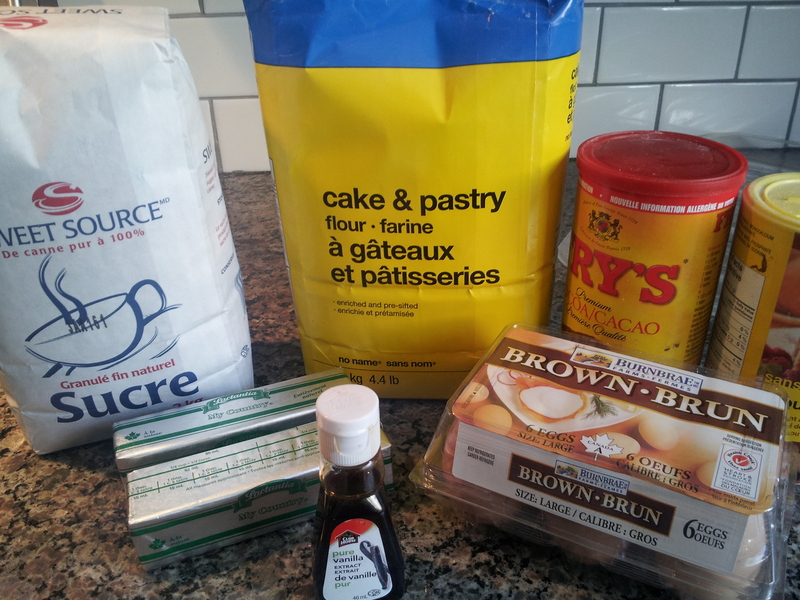 The cookbook says that this develops the cake structure. I then added the egg/cocoa mixture in three batches, mixing on medium speed for 20 seconds after each addition. I scraped the sides of the bowl to make sure all the ingredients were incorporated, and poured the batter into two 9-inch round pans that I buttered, floured, and put parchment paper circles at the bottom. The worst surprise after taking your beautiful cake out of the oven is to have it stick to the pan, so better be safe than sorry! I baked the cake at 350 degrees Fahrenheit for 25-35 minutes, or until the cake sprung back when touched. My cake took 35 minutes. I removed the cakes from the pan after letting them stand for ten minutes, and let them cool for about an hour. Next, I made chocolate butter cream frosting, and it made a lot extra. 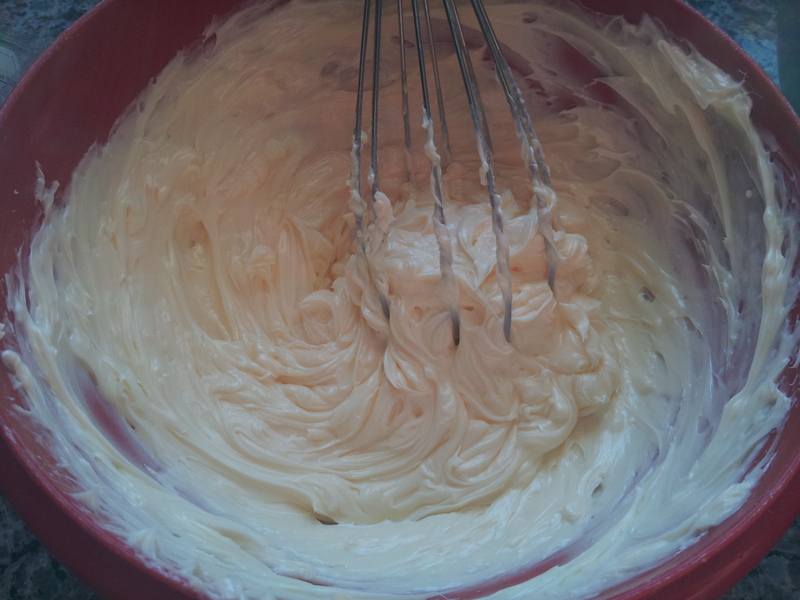 Butter cream is a recipe I learned how to make at Cordon Bleu, and I made it using their method, but used the ingredient measurements from The Cake Bible. I whisked the egg yolks with some of the sugar using a mixer and mixed until they lightened in colour. Then, I boiled the sugar and water until it reached soft-ball stage – to test that it is at this point, I soaked my hand in ice-cold water, reached in to the boiling liquid to grab some sugar, and immediately dunked my hand back in the ice-cold water with sugar in my hand. When the sugar forms a hard substance inside the cold water that resembles candy, it is at soft-ball stage (the sugar can also be formed into a ball, and when thrown on the counter, it makes a sound). With the mixer beating the egg yolks, I slowly drizzled the liquid sugar on top, making sure to mix everywhere. I kept beating the mixture until the bottom of the bowl reached room-temperature, which took about 5 minutes. In a separate bowl, I melted the butter until I could whisk it smoothly. It should look like the picture below. The egg mixture and this mixture should look very similar. I added the two together with my hand mixer. 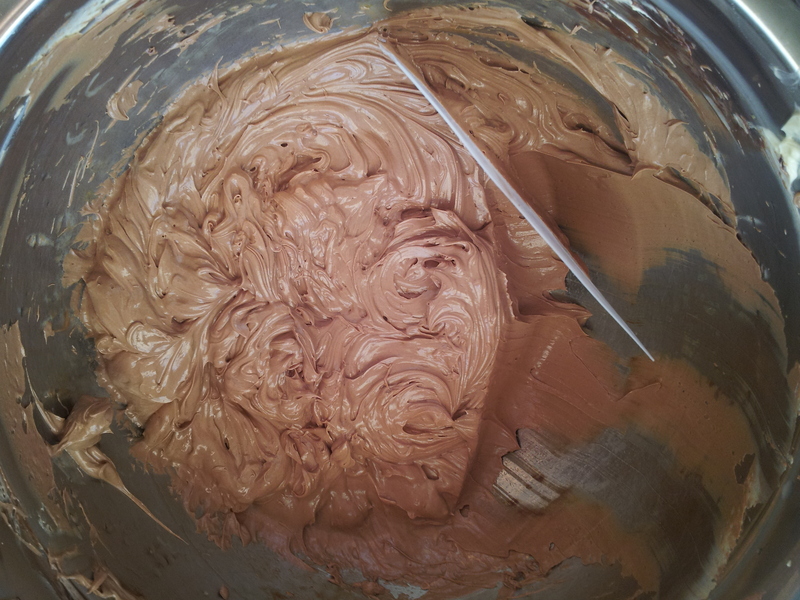 In another bowl, I melted the chocolate on a double boiler, and added it to the butter cream. I reserved a little bit of the plain butter cream for decor. To assemble the cake, I cut off about 1/2 cm of cake from the rounded top of each layer to make them flat. 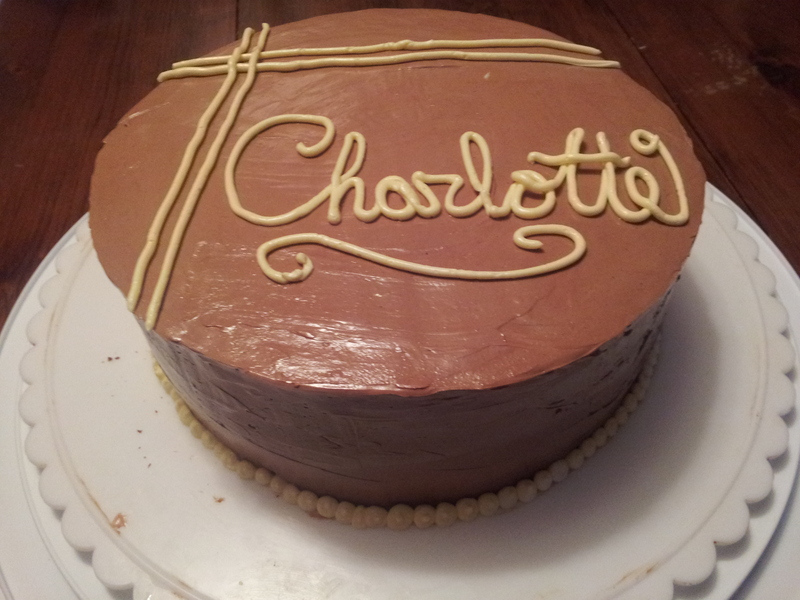 Then, I covered the cake in butter cream, and added a little bit of decor on top. I don’t understand how this isn’t vegan. And I don’t get the fuss about being vegan. Meat is good. Watch this documentary http://www.getvegucated.com/ and perhaps you will understand better why a vegan diet is appealing. Yes, meat is delicious, but humans can survive without animal products. Food for thought. Haha, no can do. I already know there might be some health benefits, but its not worth not having the taste of meat. Might as well not be alive for me at least. I just wish people would stop talking about it as if it was some kind of badge of honor or as if they need someone to support them. I think this cake looks amazing! And it tasted good too. I’m inspired, and I’ll give this a try the next time I have to make a cake. Thanks for passing on your Cordon Bleu techniques!